I’m a southern white mom. What should I teach my four kids about racism, past and present, in America? This is a question that plagued me for years. So, I just avoided the topic as much as possible. However, when one of my kids was about five years old, we were leaving a park when she said something like, “I made a brown friend.” I wasn’t sure how to handle it. I thought I was suppose to guide my kids to not see color. If we don’t see color, then we’ll see everyone as equal in value, right? We’ll eradicate racial tensions, right? But…kids can see. I didn’t point out the different races. My daughter just made an observation. I’m not saying noticing different skin colors is racism. And…yet…I felt further confusion on how to handle the whole topic of racism past and present in America. Then, my eye-opening experience in August 2017 occurred and revolutionized my life. No longer am I avoiding the topic of racism. Instead, I’ve dived headlong into uncovering as much as I can about the relationships and interactions between African Americans and whites from the past to the present. I want to understand the Civil Rights movement. I want to understand why people would accuse a Starbucks’ employee of being racist for calling 911 to get two black men to leave the store for not buying anything. I want to understand why my African American friend is always aware of being black wherever she goes. And, ultimately, I want to do my small part to ease racial tensions in America between African Americans and whites so we can live in peace with each other, trust each other, and think the best of each other. I’ve listened to Extraordinary, Ordinary People: A Memoir of Family by Condoleezza Rice. Absolutely amazing and eye-opening for my white self. My kids listened as well. I highly recommend. I read Our Auntie Rosa: The Family of Rosa Parks Remembers Her Life and Lessons by Sheila McCauley Keys. Loved it. She did much more than stay seated on the bus one day. I also watched some Globe Trekker DVDs of Africa and the slave trade. Sobering. 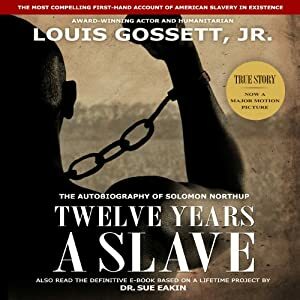 And, then, these last couple weeks I had my heart utterly broken again and again as I listened to 12 Years a Slave by Solomon Northup and narrated by Louis Gossett, Jr. In 1841 Solomon Northup was a free African American living in New York state with his wife and three young children when he was kidnapped and then sold into slavery where he served as a slave for 12 years in Louisiana before being rescued in 1853. Words elude me to convey to you the impact this book had on me. I can only urge you to listen to it yourself. Was the Starbucks employee being racist? I don’t know. Would the employee do the same thing if two white males had been loitering that day. I don’t know. But, I listen to a book like that and I think about the testimony of Condoleezza Rice of life in the South 100 years later, and I can’t help but understand at least a little that it would be really hard to trust whites if I was an African American. How we don’t have more race problems is actually quite amazing to me. I wouldn’t mind 12 Years a Slave being required reading for all seniors in high school. We need to understand where we came from. We need to understand why we as whites must go out of our way to show African Americans kindness, respect, and help them make headway in the academic world and business world. Their race was treated so horrifically for generations. We cannot undo that past. But, we sure can change the present. One of my favorite lines from 12 Years a Slave was, “What difference is there in the color of the soul?” Beautiful. Absolutely beautiful. We have a problem here in America. Whites treated blacks as less than human from day one of our country’s birth. But, that has changed. And, African Americans and whites can learn to love each other. No, we’ll always have some in either race who love hatred more. But, one relationship at a time, you and I can reach out, love, and change the world. You in your little corner and me in mine. We can start noticing color and reaching out to those who look different than ourselves. We can show respect. We can show interest. We can listen to struggles. We can learn to work together to eradicate racism from our land. We can teach our children about our past but how we can make our future better. Whites, I know you and I did not personally enslave African Americans. But, when I study our past, I can’t help but understand we are reaping what was sown before us. Horrendous, unimaginable, unspeakable sins took place on our American soil. Solomon Northup amazed me with his ability to actually praise two Southern whites that he knew during his time of slavery. He had one good master for a brief time, and he knew of one mistress with a reputation of bountiful kindness. Here this man who was taken from his home and family in the prime of his life and put under inhuman treatment was able to find gracious words for a couple slave owners. But, his overall story tells of the many awful things he witnessed and endured as a slave and is “recognized as the most compelling firsthand account of American slavery in existence.” Whites, we need to learn our history, not ignore it. But, be encouraged, one white person can make a positive difference. Although Solomon Northup encountered many hateful southern whites, he met one white southern man that was quite different. This white man risked his own life to help Solomon Northup regain his freedom which he did and consequently we have Solomon’s story to read today. African Americans, you have far too few historical records of your past. 12 Years a Slave audiobook is an excellent resource for you to understand what your ancestors endured. However, I am concerned it might kindle hatred in your heart towards whites. Yet, Solomon Northup never exudes an attitude of hatred towards whites. He hates slavery, but he doesn’t seem to hate whites. I think it will be good for you to see how far America has come. Our nation is not perfect, but we have drastically improved from 1853. I also think it will be good for you to hear Solomon’s gracious spirit and his resolve to trust God in his extreme trials. God protected him, watched over him, and used him mightily to bring down the institution of slavery in America. God can use you today to help mend our hurting nation. Whites and African Americans, let’s look at our past. Let’s look at our future. And, let’s work at seeing the color of our souls and pursue earnestly loving each other. I want future generations to be blessed by what they reap from our generation. I want my great grandchildren and your great grandchildren to be able to read 12 Years a Slave and be amazed at the radical healing God can work in a country that chooses love and forgiveness. Next I can’t do everything; but I can do something.